A Western Sahara independence activist has announced that she is refusing all medical care - three weeks into a hunger strike in Spain. Aminatou Haidar has been fasting at Lanzarote Airport since she was expelled to Spain's Canary Islands by the Moroccan authorities. They denied the activist entry to Western Sahara - a disputed region. Morocco also confiscated her passport when she refused to define herself as Moroccan on an official form. Ms Haidar's protest at her treatment has won the support of many prominent Spaniards including actor Javier Bardem and film director Pedro Almodovar - giving it a high profile. For 22 days now, Aminetu Haidar has refused all food and drunk only sweetened water. Camped out at Lanzarote Airport, she has said time and again that she will not eat anything, until the Moroccan authorities allow her back to her home. Now she has increased the pressure on the Spanish government to resolve her situation, declaring that she will not accept any more medical help at all. That decision follows what Ms Haidar calls a "terrifying" visit by a team of Spanish lawyers and medics on Sunday. The hunger-striker says they came to assess the possibility of force-feeding her, instead of forcing Morocco to allow her home. Spain's prime minister insists his government is doing everything possible to reach a solution. On Monday, Morocco's foreign minister accused the campaigner of political blackmail, saying she was acting for the separatist Polisario Front that fought a war with Morocco over Western Sahara until the 1990s. She has won several awards as a peace activist, and says all she wants is the right to go home. 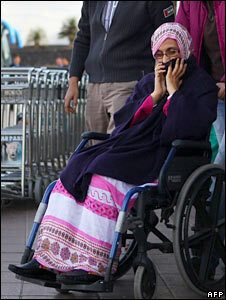 But even as Aminatu Haidar's health weakens, neither she nor the Moroccan authorities are showing any sign of compromise.